Hello my friends....have I got fabulous news for you!!! I've been asked to be a part of a wonderful, talented group of ladies who design for Paper Nest Dolls (PND). Christine is the super talented owner/artist/illustrator of these adorable images modeled after her own children. And they are adorable!!! 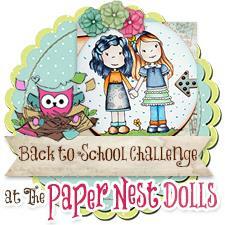 And my first post with Paper Nest Dolls is just in time for a new challenge. This PND Challenge is 'Back to School'. Challenges run for almost two weeks. This one starts today, 8/5 and ends on Friday, 8/16. My project for this challenge uses the image called 'School Time Avery'. She is colored with COPICS (see bottom of post for list) and the patterned papers are from The Paper Studio pad called 'Four Seasons'. The image is die cut with a Spellbinders large oval die for the Grand Caliber. 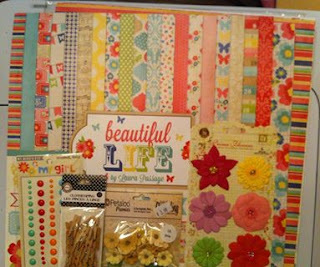 The ribbon is from May Arts and the flowers are from Hero Arts. 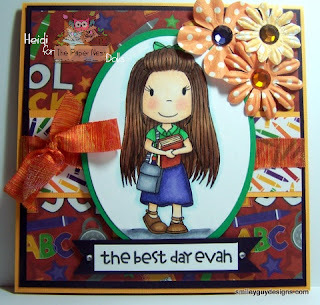 The sentiment is from a Paper Smooches stamp set called 'Slang Gang'. The bling on the card is from The Paper Studio (3mm clear) and from Bo Bunny Candy Jewels in the 'Paradise' collection. Adorable, Heidi! I love it! This is so adorable, excited to be on the team with you can't wait to see more of your creations!! Welcome to the team Heidi! Your card is so sweet. 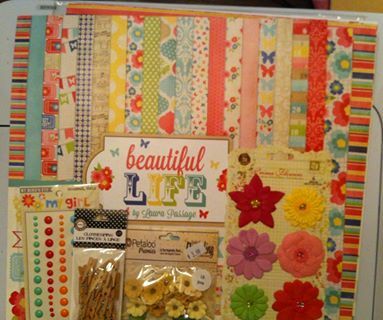 Love papers and flowers with polka dots. 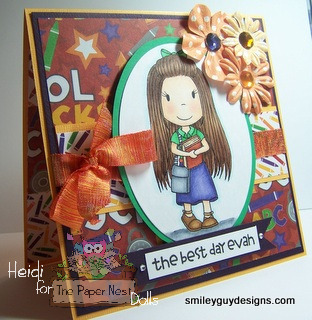 love It Heidi....and I am so glad to be working with you on the DT..